These twin line welding hoses are constructed with a black EPDM tube, spiraled polyester yarns and red and green EPDM hose covers (ACETYLENE USE ONLY). Designed to be used for general welding service, these twin line hoses are rated Grade R, have a 200 psi working pressure and meet ARPM IP-7-2011 requirements. 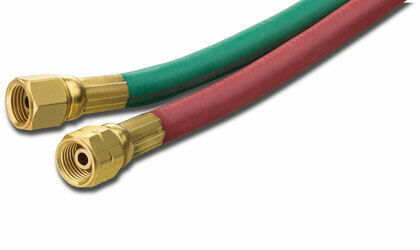 Coiled coupled assemblies are available in 25 and 50 foot lengths. Click here for more info.